Sift together the flour, cornflour, cocoa powder, baking powder, baking soda, and pudding powder at least two times, then pour everything into a large bowl. Add the caster sugar, and whisk very well. In a small bowl, combine the egg whites, sour cream, vegetable oil, milk, and tepid water. Pour the wet ingredients into the dry and blend everything on the lowest setting on your mixer, until combined. Do not be tempted to overmix the batter, because the cakes will be tough. Grease and flour three cake tins (23 cm; 9"), divide the batter evenly, and bake them right away, in a preheated oven, at 180˚C (350˚F), for about 20-25 minutes. Make sure you check them with a toothpick to make sure they do not overbake. Once baked, let them cool in their pans for about 10 minutes, then remove them to a wire rack, and let them cool completely. For the filling, start by cooking the base. Pour the milk into a heavy-bottomed saucepan, sift in the flour, and blend it well. Place the saucepan over medium heat, and cook it for about 5 minutes, stirring constantly, until thick and smooth. It can take more than 5 minutes, depending on your stove; be patient, and stir constantly, because it can very easily burn. Let the base cool until room temperature or slightly colder, but not completely cold. Crush or grind the sandwich cookies into fine crumbs. You can leave some pieces slightly larger, but most of them should be fine. Place the softened butter in a large bowl, add the caster sugar, and blend on high until completely smooth and creamy (about 5 minutes). Then, add the cooked and chilled base, tablespoon at a time, mixing constantly on high. Add the vanilla, and blend well. Finally, add the cookie crumbs and fold them through using a large rubber spatula. 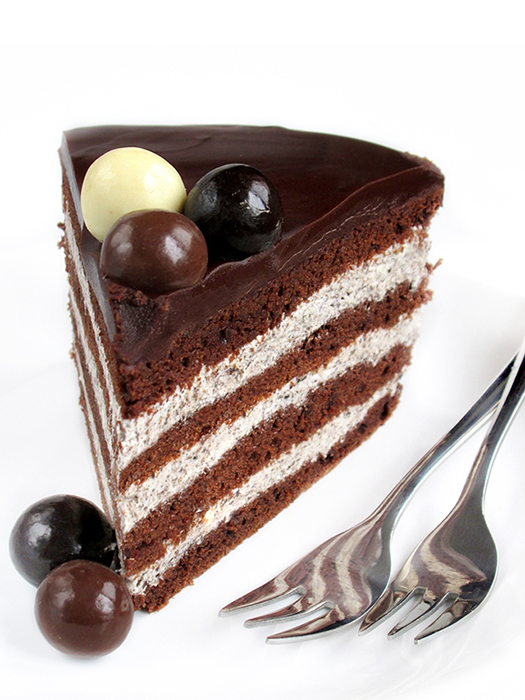 To assemble the cake, level the cakes, then cut each one into two layers, so you end up with six equal, thin layers. Place the first layer on the cake platter, and close a cake ring around it. Spread on one fifth of the filling, cover with the second layer, and so on, until you use up all of the filling, and all cake layers. Cover the top with plastic wrap, and let the cake chill in the refrigerator for at least 4 hours, preferably overnight. For the Ganache, melt together the chopped up chocolate and heavy cream (in the microwave or over medium heat), and let it sit at room temperature until slightly thickened, but still pourable, then take the cake out of the refrigerator, remove the cake ring, pour the Ganache on top so it runs down the sides of the cake, and return it to the refrigerator. Keep it refrigerated until serving time. Yields 20 servings. 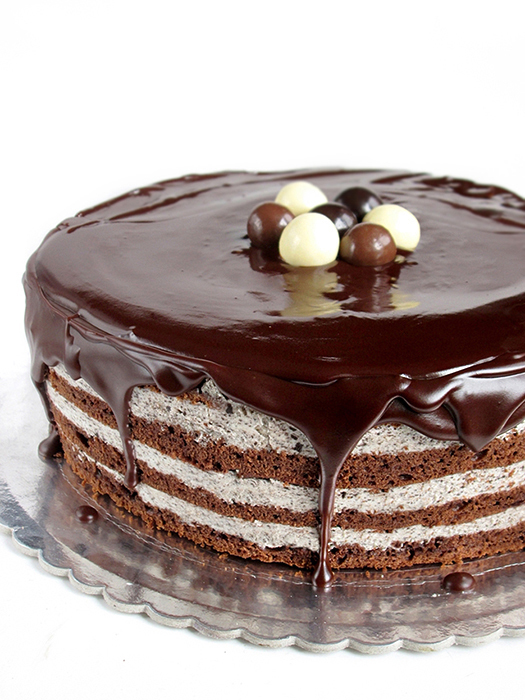 It looks perfectly moist and oh my gosh… that chocolate ganache on top is drool-worthy!